A lovely bowl from Denby in the Greenwich colourway. Stamped on the base with the Denby stamp. ACCENT PATTERN RIMS WITH CREAM COLOUR MAIN PLATE. Denby Regency Green Milk And Sugar Set. Dispatched with Royal Mail 2nd Class. 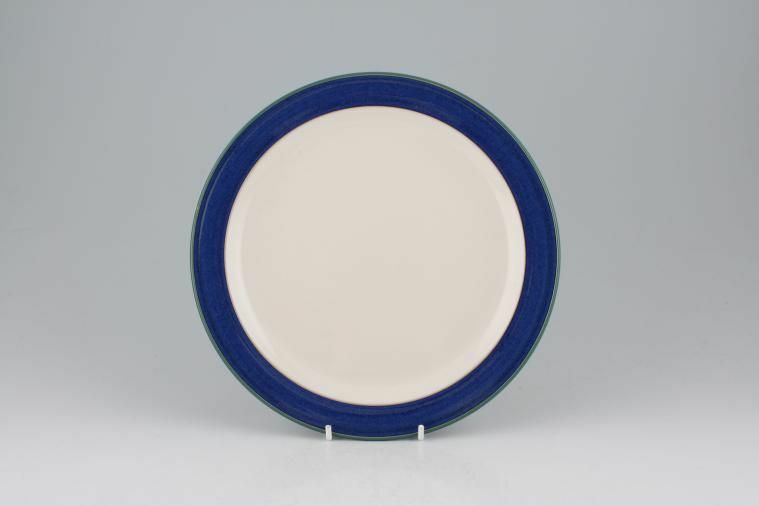 Denby Imperial Blue Tea Plate (more). Condition is Good. Hardly any use. Dispatched with Royal Mail 2nd Class. Denby Storm Purple Ribbed Cereal Bowl (more). Condition is good Used. Dispatched with Royal Mail 2nd Class. Other items listed in this pattern. These were originally bought as seconds. Colour varies on the backs of the bowls. One bowl has a slight fault on the edge. Eight Denby Chevron Soup or Casserole Bowls. Highly practical with a lovely textured surface. Denby Greenwich Pasta Bowl (more). Condition is good Used. Backstamps may vary. Dispatched with Royal Mail 2nd Class. Both Vases are fully marked Doulton Lambeth, and the Slater's Vase also has the Slater's Patent mark. The Lambeth Vase has decorator's marks of Bessie Newberry and Eliza Simmance, and the Slater's Vase has a decorator's mark, I think of Rosina Harris. 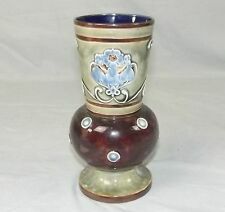 A lovely antique Doulton Lambeth decorative vase dating to 1880. It is beautifully coloured and has the decorators mark for Kate Rogers. The vase is in good condition. There are several knocks and rubs to the glaze and the area around the foot is a little rough. Denby stoneware Daybreak 38 piece dinner tea service set not boxed. The set is in style Daybreak which is green with brown trim and a white flower design. There are 38 pieces in total which includes 8x dinner plates 10" width and one of the plates has a chip, 1x saucer/plate 6.6" width, 3x cups 3" width and 2.8" height, 10x small plates 8.2" width and 2 plates have 1 chip and some have marks, 6x saucers 5.7" width, 9x bowls 6.3" width 3 of the bowls having small chips on bottom and 1x milk jug with 2 big chips on the top edge near spout. Most of the pieces are in good condition apart from the ones that are chipped with the odd piece having some marks. The set does not come with any original packaging or boxes. Rare and beautiful Bourne Denby graduated flying ducks. Stamped Bourne Denby Made in England. Largest duck has had top wing repaired however can't see this once hung up, also has line within the main body, two smaller ducks in good condition. They are 1st quality Denby Stoneware, made in England and are in the Midnight pattern which was produced from c1983 and discontinued in c1996. They are oven, microwave, freezer and dishwasher safe. 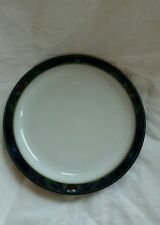 DENBY STONEWARE MIDNIGHT PATTERN. A stoneware dinner plate from the Highland Stoneware pottery founded by David Grant. Early floral pattern with celadon glaze and iron and cobalt brushwork in a typical pattern. Very good condition, but slightly ironically there is a tiny chip/flaw to the edge that you can feel on the underside. THESE DENBY AZURE COAST CUP AND SAUCER ARE FIRST QUALITY. AND HAVE NEVER BEEN USED. Quite a Few New with labels just unwraped for the photos. 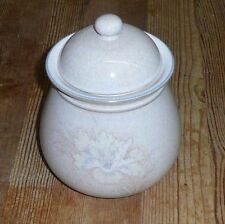 Made in the 19th Century, by Doulton Lambeth pottery from England. Rare Vintage Denby Pottery Candleholders : TIGO WARE - TIBOR REICH ? They are not shown in the advertising which appears in the book `Denby Pottery 1809-199 7' but neither are the leaf shape candleholders - so the advertising is not a complete record of the Tigo Ware designs. Lovely Highland Stoneware Scotland 1 pint puffin mug. Condition: good, no chips or cracks. Please check the photos as they are part of the description. Thank you for looking. We aim to dispatch all items within 2 working days of cleared received payments. Please leave feedback if you are satisfied with the item. We will be listing more items over the coming days and weeks, please feel free to browse. We do not accept “Buy it now” offers. Dispatched with Royal Mail 2nd Class. Denby Classic Milk Jug Or Creamer In Green And Mustard Pattern. Condition is New. Dispatched with Royal Mail 2nd Class. Makers mark & paper label to base. Holds approx: 2 Pints (1136ml). Offered this rare Doulton vase by the renowned Doulton artist Edith Lupton.It stands 16” high and measures 7 1/2” at its widest points.The top lip has suffered damage and the base has a hairline as shown in the photos.Would display well as it is or could be professionally repaired.Doulton Lambeth factory mark to base together with the incised monogram EDL for Edith Lupton and date 1881.Offered at a low start price without reserve. Denby Duck Egg Blue small Dinner Set. 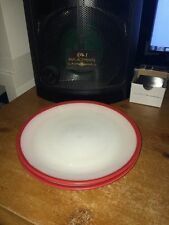 4 Dinner Plates, 4 Side Plates, 3 Pasta Bowls and 3 Cereal Bowls Condition is Used. Dispatched with Royal Mail 2nd Class. HIGHLAND STONEWARE, SCOTLAND, STUDIO POTTERY, HAND PAINTED, VASE. 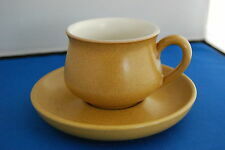 Denby Camelot Tea/ Coffee Set. Condition is Used and in excellent condition. Includes coffee pot,teapot,cream jug,sugar bowl,5 mugs and 6 cups and saucers. Dispatched with Royal Mail 2nd Class. Height is 23cm and it holds over 4 pints. A beautiful hand painted Highland Stoneware mug/cup with lovely blue iris. Stamped to the base (see photos). Floral On Dusty Rose Background ~ Made Between 1991~ 1996. Two Denby Imperial Blue and Green Footed Mugs. Large Buchan Portobello Scotland, blue stoneware pottery jug, decorated with stripes and circles. Condition: good, no chips or cracks. Measurements: approx. Height 6”/15cm. Please check the photos as they are part of the description. Thank you for looking. We aim to dispatch all items within 2 working days of cleared received payments. Please leave feedback if you are satisfied with the item. We will be listing more items over the coming days and weeks, please feel free to browse. We do not accept “Buy it now” offers. Dispatched with Royal Mail 2nd Class. Used once, so in excellent condition, no marks or chips at all. Would prefer collect in person, as I worry about a courier. However if you would prefer a courier service, please email me before bidding. Thank you. 4 x Denby Mugs in Pale Blue/Grey. This is a great set of 4 Denby mugs in pale blue/grey. 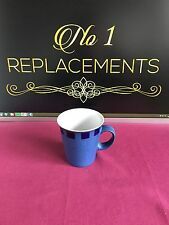 Mugs are all in very good condition and would be a good buy for any fan of Denby tableware. make Supersized seem small. Get images that. Cash on collection is accepted. Denby Greenwich Cereal Bowls X 3. In good condition. 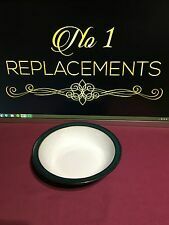 No chips to bowls but minor chips on base of 2 of the bowls as shown in photo. Dispatched with Royal Mail 2nd Class. Brampton saltglazed stoneware puzzle jug, c. 1840.